LEMOORE, CA – (January 18, 2019) – Tachi Palace Hotel & Casino’s Bingo Hall will be full of magic as magician and performance bizarrist Michael Carbonaro performs Thursday, February 28, at 7:30 p.m. Tachi Palace offers the premier entertainment experience in the area. Carbonaro has performed over 500 comically perplexing and improbable feats of magic on his hit TV series, The Carbonaro Effect on truTV. A trickster at heart, Michael performs inventive tricks on unsuspecting members of the public who are unaware that he is a magician. Jaws drop when he causes a car to disappear from under a security guard’s nose or makes alien crabs transform into kittens in a science lab. Whether posing as a coffee shop barista, museum curator, or seemingly unremarkable store clerk in the real world, Carbonaro’s illusions – along with his absurd, matter-of-fact explanations – leave real people bewildered and families at home laughing out loud. 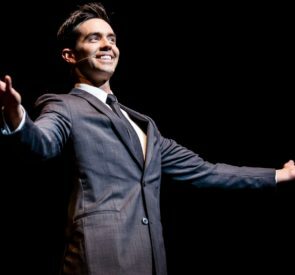 Carbonaro’s family-friendly show is jam-packed with audience interaction, hilarious video clips, and a whirlwind of mind-blowing magic performed live on stage. Named “Magician of the Year” by the Academy of Magical Arts, Carbonaro also has been presented with the first-ever “Copperfield Prize,” which recognizes an individual for elevating the art of magic. Tickets, starting at $35 per person, are on sale now and can be purchased online at TachiPalace.com or at the Hotel Gift Shop. Premiere Club Members receive $5 off at Gift Shop. Doors open at 6 p.m. and the show starts at 7:30 p.m.